Manish Malhotra’s bridal collection themed Destination Wedding stole the show at Couture Week. Manish Malhotra’s show for the Couture Week saw the who’s who of Bollywood all dressed in their classiest best rooting for Manish. The show titled “Destination Wedding” was Manish’s trendiest bridal collection yet. The front rows were occupied by Manish’s industry friends some of which included Karan Johar, Kajol, Raveena Tandon, Imran along with beau Avantika, Preity Zinta, Srivedi and Bonny Kapoor, Uday Chopra, Ameesha Patel, Sophie Choudary, Diya Mirza and Priyanka Chopra, Dino Morea, Nandita Mitani, Vogue Team, Sheetal Mafatlal, Aarti Surrendarnath, Kavita Chogule, Raheja’s to name a few. The collection had a contemporary almost Mediterranean feel with white drapes and crystal chandeliers. In true Manish Malhotra style the collection played with a lot of young and trendy colors like ivory, peach, pink and gold and saw the use of a lot of velvet and chiffon fabrics. Keeping in mind the theme of the show the music was a mix of House music with Indian Wedding Beats with a mix of Love Aaj Kal Movie. The designs seemed like it was a wedding in Bally or in the Mediterranean region. Weddings are the most important day in a person’s life; the collection was very sophisticated and it would look like out of the world wedding collections. 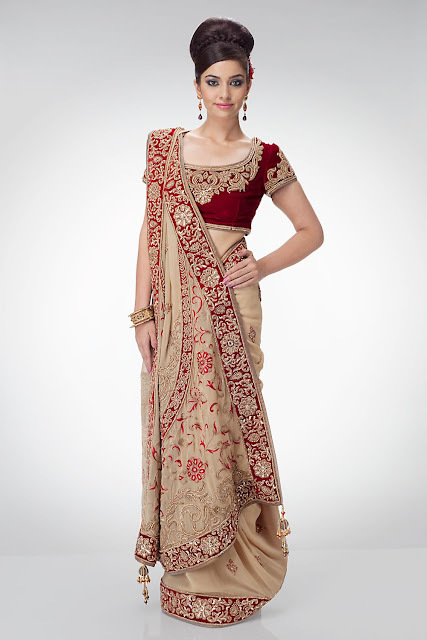 The designs with seductive lengas and beautiful fabric just added to the perfection of the outfits. 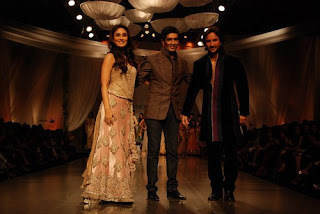 The show stoppers for the event were the very much in love Kareena Kapoor and Saif Ali Khan walked hand in hand on the ramp to much of the audiences delight. The show was packed to the brim with all seats filled to their maximum. What started with a loud applause ended with the audience watching the show in complete awe and wonder. Manish Malhotra sure knows how to throw a grand show. His contemporary bridal collection “Destination Wedding” showcased at Couture week has become the talk of the town.